Abstract submission deadline has been extended to 10 April, 2016. The acceptance will be given around 24. April 2016. The abstracts accepted will be published in the symposium book delivered to all participants at the meeting. The full text should be prepared for the conference and sent within a few days after the end of the conference to the Editor. Attendees with accepted abstracts are invited to submit full article contributions to the International Journal of Polymer Analysis and Characterization following the journal guidelines. 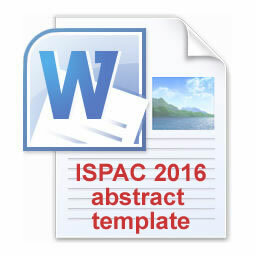 Submitted articles which are peer reviewed, recommended and accepted, will appear in regular issues of IJPAC with a remark that the contribution has been presented at ISPAC 2016 in Singapore. The Word format for the abstract is described below, however, for your convenience you can download a Word template file by clicking on the image on the left side. After download, you can edit the Word file and upload it using the Abstract submission form. Maximum file size for upload is 5 MByte. There must be one blank line between the title, the authors’ names and their affiliation and two blank lines between the affiliation and the beginning of the body text without any punctuation marks at the end of these lines. All abstracts must be written in English and occupy a maximum of 1 page A4 written in times 12, alignment in mode “justify”. Please make sure to respect the following margins: bottom, right: 2.5 cm; top, left: 3.0 cm. Reference citations  are shown in the text by a number in brackets and follow one double space below the body text under the heading “References” in times 10. If figures or images are included in the abstract, please insert them as .jpg files. Figure 1: The figure caption is written in Times 10 and aligned with the picture. In order to ensure a smooth abstract booklet preparation, please do not insert text or references in “footnote” mode or other encoding. - The heading “References” follows one double space below the body text in times 10 bold. Reference citations are shown in the text by a numeral in brackets and cited under the heading “References” in times 10. – P.Noble and B.Collin, J. Polym. Sci. 132, 425 (1975).